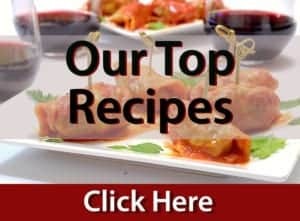 I’ve been in the kitchen in one capacity or another, for quite a few years and my motivation to try new recipes has come from many sources. Maybe I tasted something that a friend prepared, or something that caught my attention in a restaurant, or perhaps I saw a tantalizing photo in a magazine. The impetus for this post is a first for me, and I have to say, I loved it. 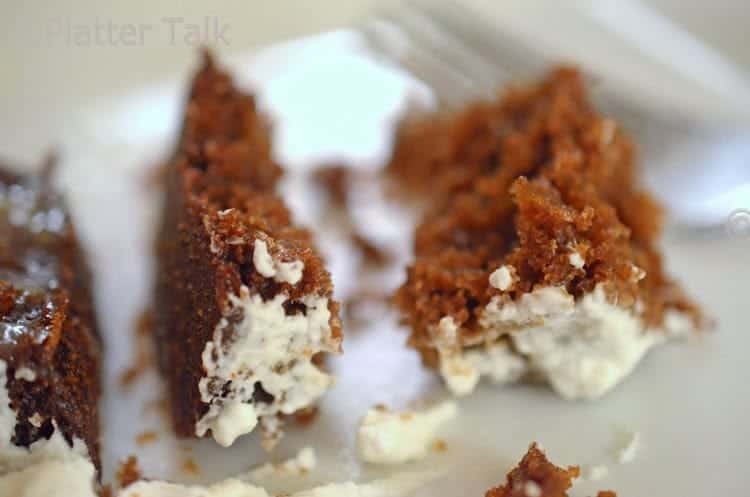 A reader from the West Indies contacted me and asked if I could help her our with a ginger cake recipe. Thanks for the request, Lizzy. This one is especially for you. Throughout the past couple of years, I’ve been becoming increasingly more familiar with fresh ginger root. Here on Platter Talk, I’ve featured it in a mac ‘n cheese, Scott put a family cookie recipe together using ginger, and we have a really, really good pizza recipe on the stone that will be appearing here on the blog in the near future. Although I was delighted to put this together for Lizzy, there are many reasons why we all may want to consider adding a little more ginger to our diets. We all know it’s been around forever. What many of you probably are not aware of are the health benefits associated with this ancient rhizome. Even Confucius extolled the virtues of ginger, back in 500 B.C. If your parents gave you some ginger ale to sip, for an upset stomach, it was no coincidence. Ginger has been long used as a treatment for gastrointestinal disturbances. On a much more personal level for me, ginger has also been recently recognized as a potent agent to ward off the evils of ovarian cancer in women, the very disease which tragically claimed both my beautiful mother and her younger sister. I’ve never had a piece of ginger cake prior to this, in fact I didn’t even know such a thing existed (further evidence of my sheltered life.) Upon doing a little recipe digging, I was delighted by what I saw as typical ingredients, molasses, eggs, flour, and ginger of course. All pretty basic, and importantly – few in number. Along this same line, you can make this cake with a couple of mixing bowls and a fork. 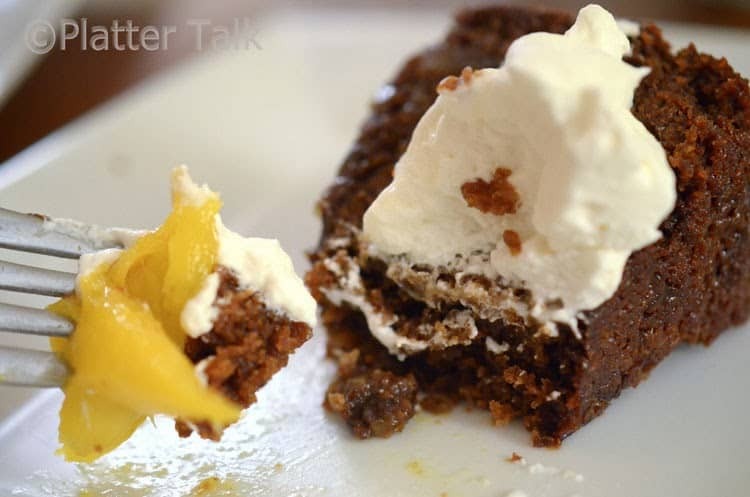 Originally, I was going to garnish this ginger cake with some sauteed peaches. Perhaps it is the blizzard conditions predicted for later today and we are about as far away from peach season as we can be, or maybe because of our son Isaiah’s insatiable love of mangoes, or maybe it is because that in just a few days Scott and I will embark on our annual pilgrimage to the beach and rain forest of Costa Rica, the tropical paradise is laden with mango trees – for one or all of these reasons, I decided to use a couple of fleshy, golden mangoes to crown this cake. 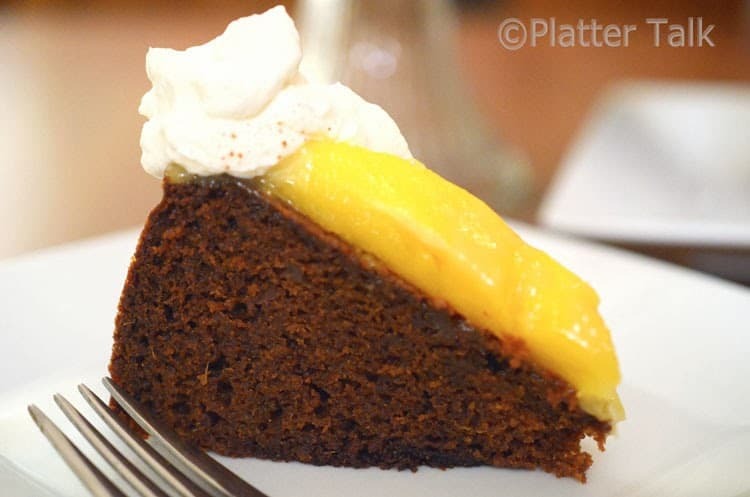 The mango, gently cooked in a brandy and cream reduction, complete the flavor profile of this ginger cake, replete with mild spice and light citrus, all capped by a dollop of creme fraiche, affording just a bit of added complexity and flavor structure. 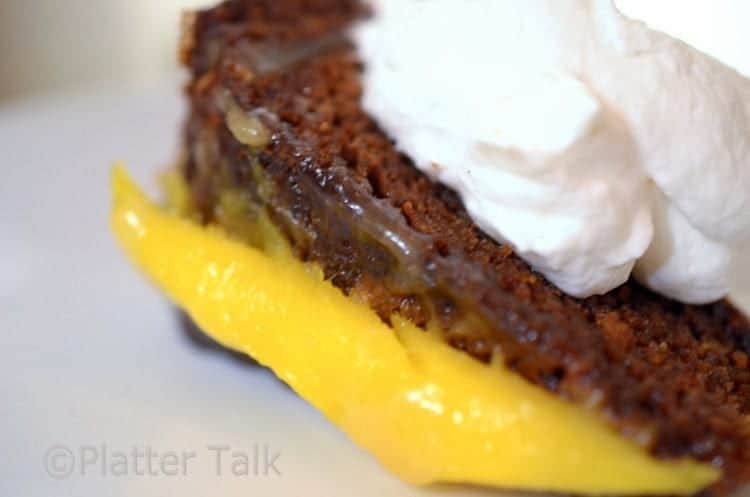 Easy and flavorful with a good presentation, this Ginger Cake with Mango and Brandy Glaze is an all-around winner. The boys loved it. The dads loved it, I can’t imagine that you won’t as well. I hope you give it a try. Position the oven rack in the center of the oven. Line a 9 by 3-inch round cake pan or a 9 1/2 inch spring form pan with a circle of parchment paper. Using small food processor, finely chop candied ginger. In separate bowl, add flour, cinnamon, cloves, and baking soda. Add boiling water into the molasses mixture and stir in ginger. Introduce dry ingredients, a little at a time, into the batter. Add eggs and continue stirring until thoroughly combined. Pour batter into prepared pan and bake for 1 hour or until a toothpick inserted into the center comes out clean. Allow to cool in pan for 30 minutes. Remove cake from pan and peel off the parchment paper. Peel and slice mangoes, lengthwise, into 1/3 inch thick slices. Place on plate and drizzle lemon juice over them and set aside. Melt butter over medium heat, in large saute pan, add 1/2 of sugar. 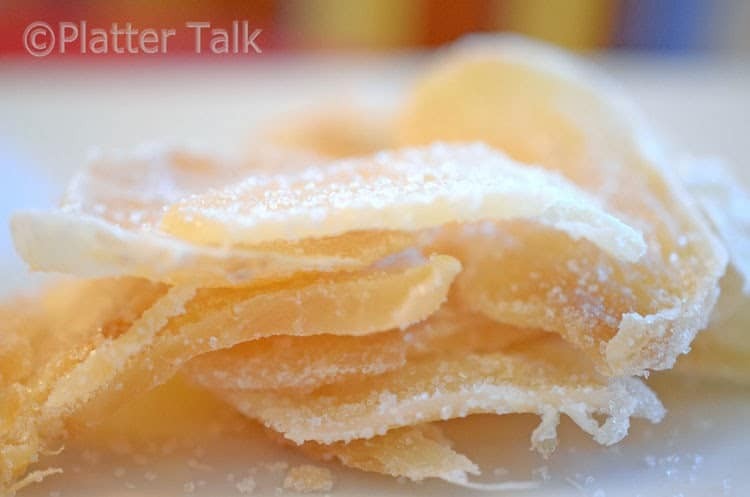 Place mango slices in single layer and sprinkle remaining sugar over them. Saute lightly for 5 to 7 minutes to soften mango slices. 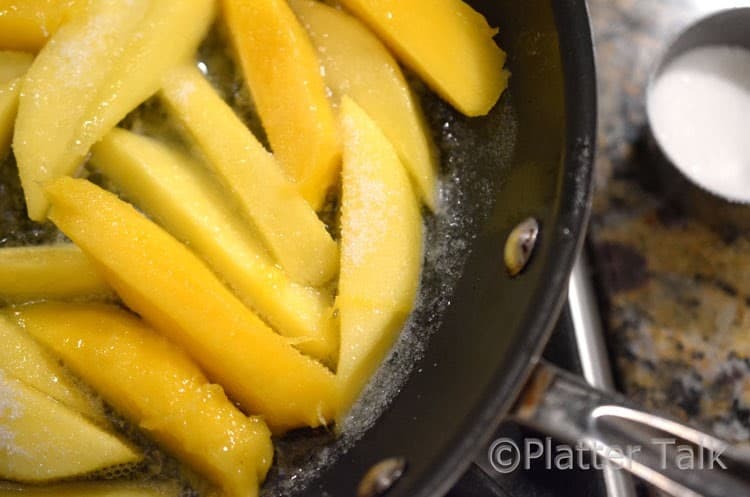 Use tongs or slotted spoon to remove mango slices and set aside, reserve juices in pan. Take 1/4 of mango slices and and chopped finely in food processor, set aside. Add brandy and cream to pan of juices, increase heat and stir until mixture reduces to a brown, caramel colored sauce. 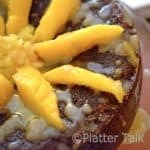 Arrange mango slices in circular fan patter around top of cake. 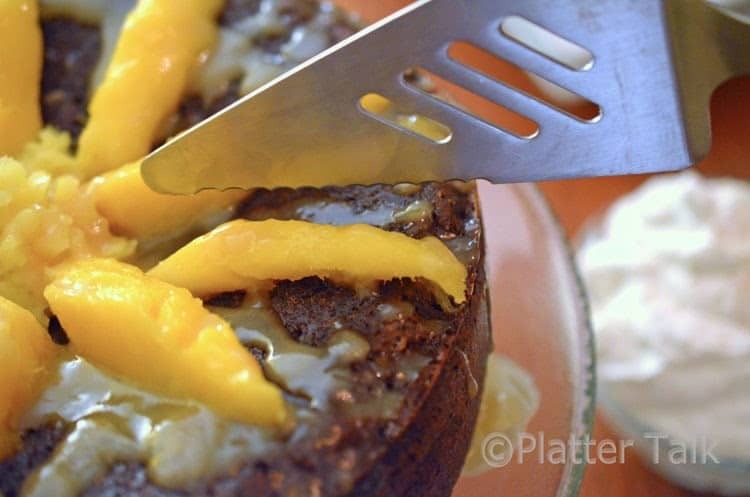 Place 1/2 chopped mango in center of cake and add remaining 1/2 to sauce and stir. Drizzle sauce over top and sides of cake. Top with optional whipped cream or creme fraiche. For a bolder ginger flavor, use 4 oz fresh peeled ginger in place of the candied ginger. Run a knife around the edge of the cake to loosen it from the pan before removing. Mangoes should be ripe, but still firm (and over-ripe). I totally love any type of “gingerbread” flavour, so this cake looks like it would be perfect. Love the glaze and the addition of brandy. Perfect fall dessert…and I would eat it for breakfast too. YUM ginger cake! I haven’t been baking in ages as I moved to a new place and still don’t have an oven, it should arrive in 3 days though. Love the addition of mango and brandy! This cake looks really tasty. I might make it for my 5 year olds birthday next week. This sounds absolutely delicious! What a wonderful treat….and that bourbon glaze, speechless! Amazing! 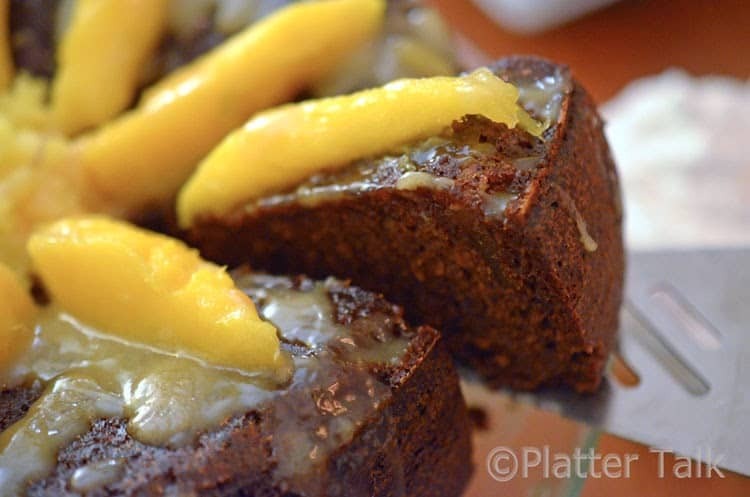 I love the pairing of ginger and mango here! Candied ginger is one of my favorite ingredients; I’ve been known to snack on small pieces, especially when I’m feeling under the weather. I bet it’s amazing in this beautiful cake. How did I miss this beauty ? Love anything with ginger as an ingredient, therefore, I have to love this one too! Right ? 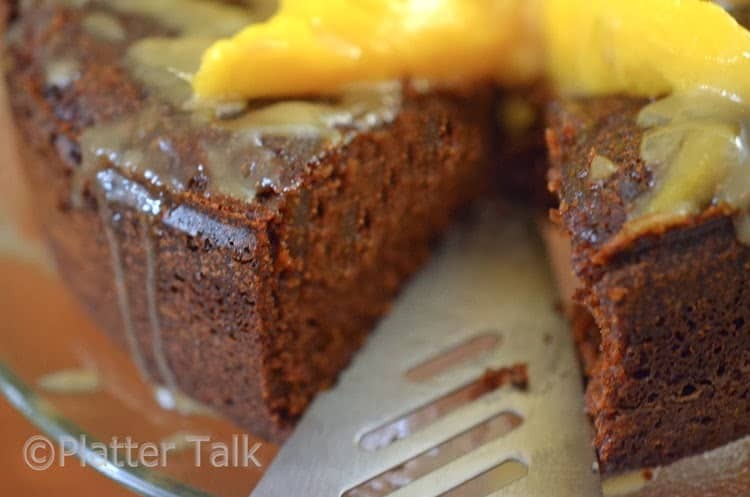 While I have been brought up on ginger (my mom and now I make just about every savory dish with ginger, garlic and onions), I have never had a ginger cake before. The texture of this cake has me drooling! I wish I could grab me a piece through the screen! Ginger is one of my favorite flavors, both for dessert and in savory food! This cake is stunning! Thanks for the comments, believe it or not, or family is still nibbling on this beauty, a day or two after the fact and it’s still delcicous! I love ginger and I love mangoes. Put them together? Bliss! This looks wonderful – thanks. It is a pretty dreamy combo. Thanks for the comments! Dan, what sensational flavors presented in this cake! The body and texture of the crumb appears to be spot on. As previous readers have mentioned, I too am intrigued by the pizza. 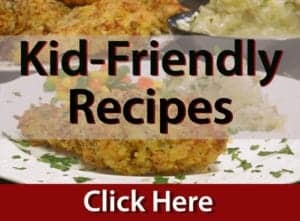 You realize you’re locked into sharing the recipe now. Lol! How nice to get your comments, as always. I had a slice of this last night (a day after I made it.) I think the flavors may have melded and developed a bit from when it initially came out of the oven; I dare say it tasted even better! As for the pizza, it didn’t last long at all! It took me a while to warm up to ginger (couldn’t help the pun), but now that I have I seriously love it. I mostly drink it in tea or eat it in chews or stir fry sauce. I have never baked with it. This cake looks amazing though, and I’m excited about a pizza with ginger! Thanks for your comments. I have to tell you, the flavors of this cake are amazing. And, you will love the pizza! So happy this got requested, because it looks incredible! Can’t wait to hear about that pizza, too!! It’s always fun to try something new, especially when it turns out this delcious. Thanks for your comments!